No, you have not reached Planet Debian, this is really Planet GNOME. Some people have been asking what is going on with accounts creation for GNOME CVS and shell access recently, as requests are taking much longer than usual to be resolved or even responded to. While I don’t believe our average response time during the last weeks has been at all bad, compared with other projects and such, it’s certainly bad for GNOME standards, so here goes a short explanation. Basically, our Accounts Team has people enough to handle all the requests very quickly in normal conditions and give people their accounts within 48 hours after the request, including verification, confirmation and everything else. When a couple of these brave people can’t work on GNOME account management for any reason, the rest of the team can still cope and do the same procedures within a week. However, we are obviously not prepared to have ALL of the members away at the same time, and that is what struck us some weeks ago. Speaking about panic, these delays have been making people ask about the status of their requests a bit too frequently. I am preparing a guide, and going to post it here and on devel-announce-list when it’s ready and all, but as a quick summary: if you’re considering a ping, think twice before you do it. We use our Request Tracker and nothing else for account requests exactly so that they do not get lost. If you have received the automatic reply saying your ticket has been filed, you can be sure it will be processed when its time in the queue arrives. Tickets are not rejected, resolved or in any way closed without the requestors being notified and if there is something wrong with your request, I assure we are going to mail you back to ask some questions. Requests do not ever get thrown into /dev/null, and asking about their status only wastes time from the Accounts Team with replying stating it is just the normal delay, merging duplicate tickets that are created more often than not, etc. So I’m giving this talk at FISL in two weeks from today, about how people can contribute to GNOME. I had already prepared such a talk before, but OpenOffice kindly ate it (after I presented it, at least), so now I have to rewrite it from scratch: perhaps a nice opportunity to improve it. I’ll mention everything that I can remember, from hacking to infrastructure, accessibility, translation, documentation, marketing, etc. But there are some areas with which I am not deeply involved (or not involved at all), with which some expert could certainly help me so it is not badly represented. Based on the cool statistics we have on Bugzilla, people had been requesting such kind of information for other GNOME services too for quite some time. So here we go with the first half of it. There is now an experimental “Top 15” for tarball uploaders on http://ftp-master.gnome.org/~gpastore/top15.html: it will contain monthly information (which means tarballs uploaded in March will not count for the statistics in April), and will sort people with the same number of uploaded tarballs by whoever uploaded a tarball first. Suggestions welcome, and patches for the page too: I’m really quite far from being an HTML expert Enjoy! Now we only have to get over with the basic user guide the Sysadmin Team promised so people complaining realize how great this change is. Posted on February 11, 2006 2 Comments on Subversion, yay! I must say it has been extremely fun to take care of gnome-terminal since I claimed it on desktop-devel-list on January 4th. I hope I am not doing too bad a job as its new maintainer and, in case I am, people are welcome to tell me. Now, after releasing 2.13.1 little time after I took it over mainly because of a rather annoying bug introduced in 2.13.0, and after some more time of pregnancy, I could not give birth to the latest and coolest release of gnome-terminal ever. I had worked on it, but there were some basic features I would really like to implement for 2.14, and I would barely have time to release the tarball on time for GNOME 2.13.5. Hence, I rushed to come up with some simple patches for roughly implementing some things I wanted, and applied some not-too-good patches after checking they were not too disruptive, and asked someone else to do the release for me (huge thanks to Emmanuele Bassi for doing it). The result, as you may guess, was pretty good: a reasonable amount of cool new and fixed stuff, together with a ton of bugs in my Inbox the following morning. Sorry for that. Most of them were duplicates, at least, and there are basically two issues, one of which has already been fixed. The other ones (e.g. the huge tabs) are being worked on, and should land on CVS HEAD quite soon. Please bear with me. =) But really, besides this round of bizarre bugs, it’s pretty nice, please try it out! 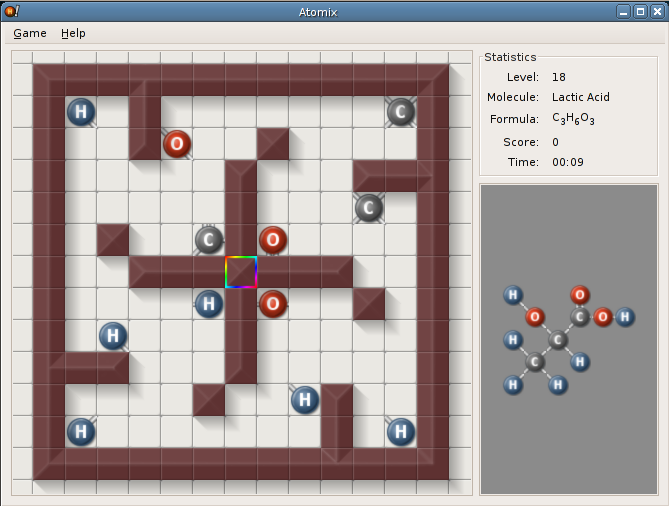 To those of you who do not read gnome-announce-list, or for those who do and wondered what “Include formulas of all compounds in the interface” meant, Atomix, the nice molecule puzzle game, 2.13.4 is out!. Suggestions are, of course, greatly appreciated! Enjoy!